In 1919, when most women only dream of adventure, Jade del Cameron lives it. After driving an ambulance along the front lines of the Great War, Jade can fire a rifle with deadly precision. She may look like a pinup blonde, but she's smart and tough and doesn't shy away from a challenge. 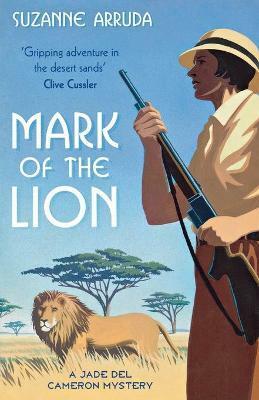 So when she agrees to fulfil a fighter pilot's dying wish - that she investigate the death of his father and track down his half brother - she sets off for the wilds of colonial Africa ...never expecting to become involved in murder. Rich with mystery and adventure, Mark of the Lion introduces a fascinating new heroine years ahead of her time, and explores the elusive heart of a compelling and exotic world. Suzanne Arruda, a zoo keeper turned science teacher and writer, is the author of several biographies for young adults. An avid hiker and gardener, Suzanne lives in Kansas with her husband, and her cat, Wooly Bear.